High Peak Heliski was conceived with the sole intention of making your next New Zealand heliski trip a seamless, simple and highly enjoyable experience on some of the finest ski terrain the Southern Alps has to offer. Based on our experience with running our all-inclusive guided ski coaching and lodging business, we saw the opportunity to offer an all-inclusive experience that was focused on heliskiing with plentiful non-heli ski options on no-fly days. Our clientele are usually highly motivated, work-hard play-hard types of people who want a real ski adventure but don't have a lot of spare time to invest in planning it. By offering an all-inclusive solution to this dilemma, we take on the responsibility to get you the best possible results from your trip, regardless of what the weather or snow conditions throw at us. That's our promise to you. You simply arrive in Christchurch. We take care of everything else. It's that simple. High Peak Heliski is run by Simon and Kate Guild with help from their family based at High Peak Station. Simon and Kate run a year-round outdoor leisure operation offering discerning guests such activities as fishing, hunting, private touring and skiing. When July comes around, we are 100% dedicated to hosting heli-skiers from across the world. The lodge is complemented by the services of Hilary Sheldon, our brilliant chef. Hilary has vast experience in quality cooking, having run her own restaurant for ten years. She ensures that the energy spent on the mountain each day is replaced via some mouth-watering, locally sourced dishes. Tom Dunbar, Simon's brother-in-law, heads up the non-heli ski guiding aspect of the ski operation for those days when the helicopter isn't flying due to weather. Tom's experience as a former professional skier on the Freeride World Tour means that he's well equipped to get the best out of our local club-field mountains. His wife Amelia (Simon's sister) assists with guiding and hosting on a regular basis too. 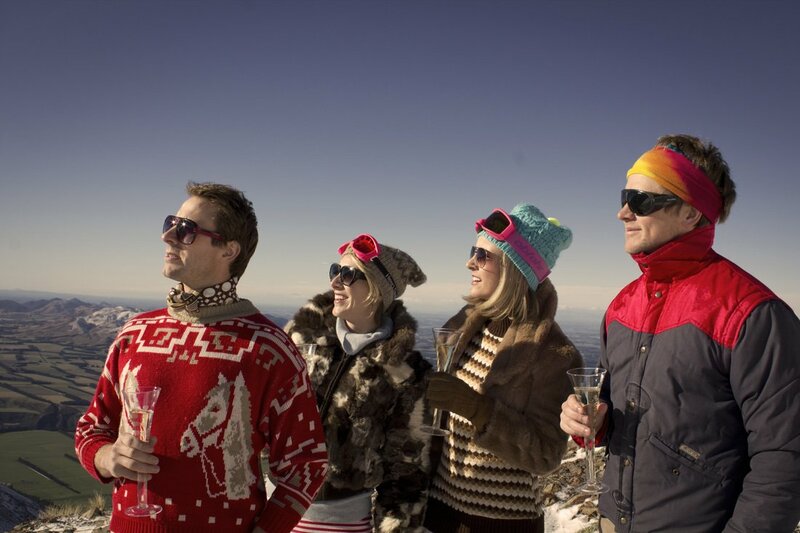 Simon, Amelia, Kate and Tom in their high fashion apres-ski leisurewear.